Scratching, for cats is a very natural, instinctual behavior that serves several important purposes. 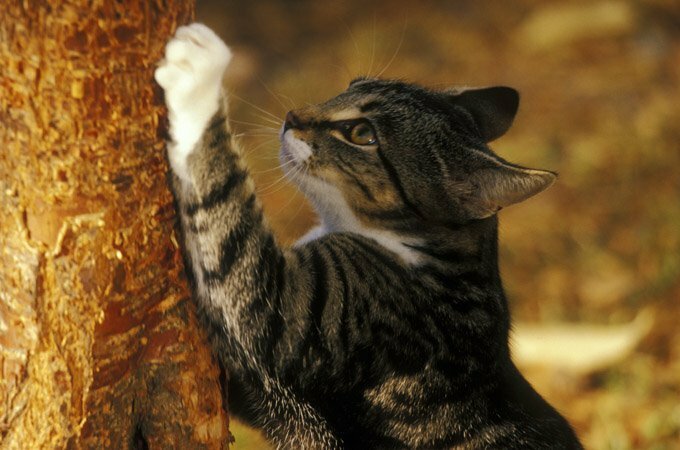 Cats scratch in order to mark territory with their kitty scent and shed old cuticle tissue from their claws. Many people opt to declaw their cats because the animals are inside cats – they would never, ever let their beloved kitty outside to fend for himself. But even inside cats can slip past your ankles when you’re paying the pizza guy and dart off. Your inside cat may one day have to protect himself from some very formidable outdoor predators. Coyotes, raccoons, dogs, and other cats can be real threats to any feline; a cat with no claws is a much easier target. Scratching just plain feels good for cats. According to the AVMA, when a cat extends her claws, she is stretching the muscles in her limbs and back, a motion that is therapeutic and relaxing for kitty. The bottom line: a cat scratches because it is enjoyable. The first thing that you should keep in mind is your cat is always going to want to scratch. Your goal, then, should be to redirect your kitty’s behavior to something more acceptable than your favorite chair.